Even as someone who works from home, I still struggle with working clean food into my daily meals and snacks. Especially when I’m looking for something quick, it can be a hassle to try to whip up something healthy if the veggies and fruits aren’t already prepared. I wasn’t really interested in any of the meal kits that are so popular now, because I was specifically in need of a solution for breakfasts, lunches and snacks—fast food but good food. Daily Harvest seemed like the perfect fit when they reached out to me a few months ago. They deliver frozen bowls, smoothies, soups and lattes that are easy to prepare in minutes. Everything comes in compact and portable cups that are easy to store without taking up too much room (hello, work minifridge) and can be carried with you on-the-go. The cups are filled with nourishing fruits, vegetables and superfoods that have been frozen to lock in the nourishment and ripeness, so the brand is able to provide meals and snacks that contain farm-fresh organic produce no matter where you live, any time of year. All of their cups are vegan by default. 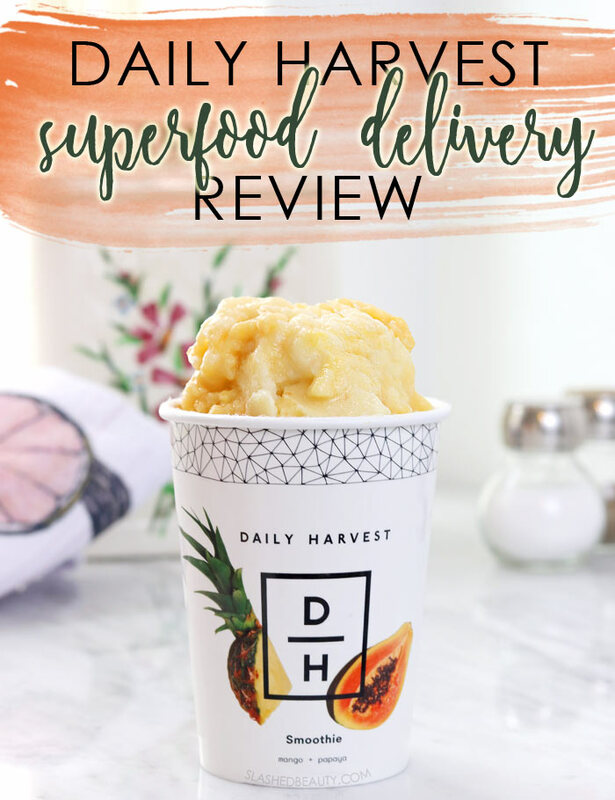 When shopping on Daily Harvest, you choose a delivery plan of 6, 9, 12 or 24 cups delivered weekly, or one shipment of 24 cups delivered monthly. The more cups you include in your order, the better the value— a shipment of 24 cups makes each one only $6.99. The cups are delivered carefully in an insulated package with dry ice. The method is extremely effective, and my packages have sat on my doorstep in Las Vegas for hours without anything starting to thaw. Of course, it’s always best to get it in the freezer right away but I know this isn’t an option for people who work outside of the home during normal delivery hours. Your package will be fine as long as you bring it in the same day it’s delivered, in my opinion. Smoothies have been my go-tos in the morning or when I have a mid-day sweet tooth. The smoothies only contain the frozen, pre-chopped veggies, fruits, seeds and nutrition powders so you can add either water or milk to complete the drink. 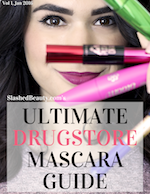 I favor using almond milk, and I blend everything up with my stick blender right inside the cup! The lid of the smoothie cups even has a hole for straws, so you’re already reducing and reusing. Similarly to smoothies, you can blend the Daily Harvest Latte cups with your milk of choice for an iced drink, or heat them up in a microwave safe mug for a hot drink. My favorite is Chaga & Chocolate. It’s immunity-boosting and a guilt-free take on an indulgent drink. 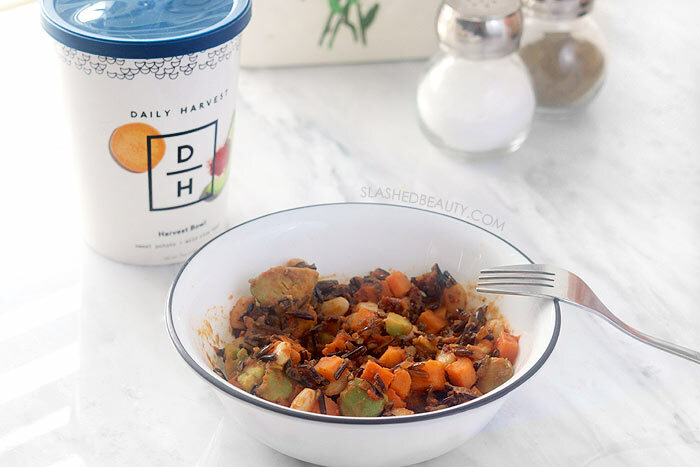 The Harvest Bowls and soups from Daily Harvest are my lunch saviors. So easy to either warm up on the stove or in the microwave, and you can eat them alone or supplement them with meat or other veggies and add-ons. As I mentioned before, all their cups are vegan so it’s up to you whether you want to keep them plant-based or add meat/dairy/eggs etc. The bowls usually include a range of veggies and a type of grain, while the soups are typically grain-free and you just need to add broth or water to them. 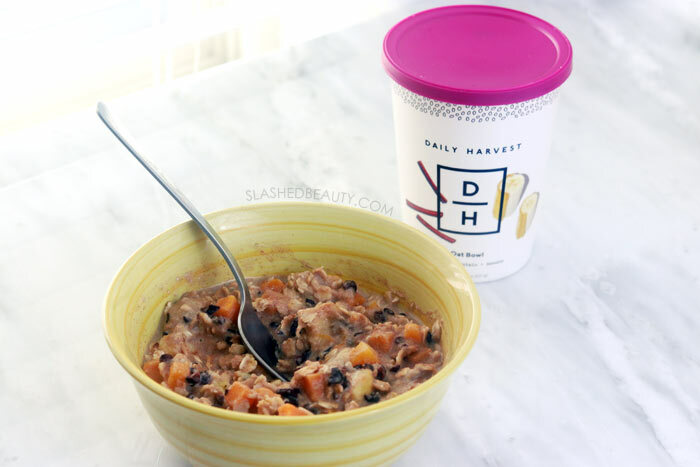 A great option for breakfast, the Daily Harvest oat bowls are packed with energizing ingredients and fiber form the organic rolled oats that will keep you fuller longer. You can prepare these either straight out of the freezer on the stovetop/microwave, or let them soak in the fridge overnight with milk to create overnight oats. The chia bowls are great any time of day, but will provide all-day energy with whole fruit and organic chia that delivers omega 3s, fiber, antioxidants in a low-calorie pudding. Just like the oats, these can be heated up in a few minutes flat or soaked overnight. I’ve seriously enjoyed keeping Daily Harvest cups in my freezer. Not only are they just plain convenient, but they’re delicious and I feel so much lighter and clearer after working cleaner food into my daily meals. I started out just eating the cups on their own (besides the supplemental broth or milk needed to complete certain cups) but now I’m starting to experiment by adding on foods like avocados, chicken breast, or eggs to the harvest bowls for something a little heartier. All the cups are pretty low calorie (for my diet) so I have wiggle room to experiment. 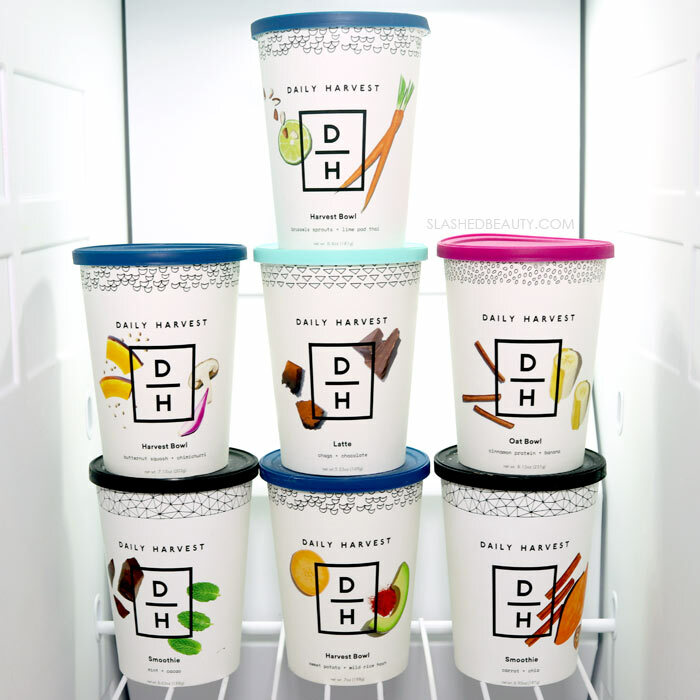 Daily Harvest definitely has an edge on the typical “meal delivery services” because of the multiple ways to prepare both in and away from home, and the fact that everything is already done for you besides the heating up! Plus, having the cups frozen means you can stock up and eat them at your convenience. 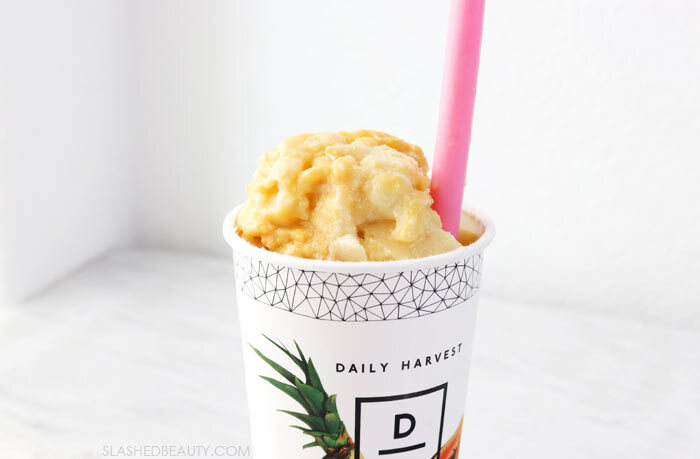 Check out Daily Harvest on their website and don’t forget to use code SlashedBeauty for 3 free cups in your first order! Have you tried any meal delivery services? 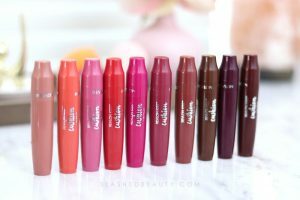 I think my husband would love those! That totally makes sense– this is definitely catered to that person who just can’t seem the time to do all the chopping and shopping for themselves, and is spending the same amount of money (or more!) on junk food. I absolutely love meal services. I know that the price can sound scary but considering that I’m easily spending $8 at McDonalds for crap food every day, it evens out. I’ll have to check into this service! Exactly! This is definitely catered to those who are spending the money eating out, and gives them a healthier yet still convenient option. I’ve never heard of this, what an interesting delivery service. That first pic looks so yummy! It really is unique to all the other services where you still have to do most of the prep work! I love a good smoothie! I’ve been making protein smoothies a lot lately. all of their cups are plant-based! people can add meat protein if they wish but it’s all vegan by default. It seems pretty expensive since 24 x $7 is $168. I don’t know if I’d be willing to spend that much. But I’ve never used a food service so maybe the prices are in line. The smoothies sound the best to me. It definitely beats eating out daily at work or school, which can run around $10, at least what I used to pick up for lunch myself!